Students have the opportunity to identify values that support social cohesion and consider ways in which this can be undermined or strengthened by individual and collective action. Investigate the website for Linda and Vika Bull and try to get a copy of one of their CDs. Copy out the words of some of their songs that appear to be talking about their sense of identity. What appear to be the beliefs and values they sing about? 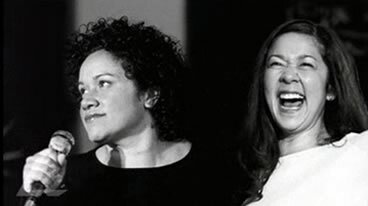 Linda and Vika Bull use music to record some aspects of their Tongan culture. How can music contribute to the preserving of oral traditions and the presenting of sometimes controversial issues. Discuss in class the effectiveness of recording past events via music as away of influencing citizens’ views. Try to find other music examples of this approach. Using the video clip, what issues did Vika and Linda face when they visted Tonga? Do you think a wish to return for a visit to their original homeland is a common experience of many immigrants to Australia? Does this suggest that some migrants cannot decide if they want to be an Australian citizen? Is it possible to be Tongan/Australians? Or can you only be just one? How can ‘Australian identity’ be defined while at the same time recognising the the diversity of cultural values of different groups of people? In small groups, ask students to investigate the economoc, social and cultural connections of Australian people to another chosen people in the Asia-Pacific region. Ask the groups to consider an action plan about how principles of friendship, peace, social justice and mutual respect might be developed between the people of their chosen case study country and Australian people. Give the students an opportunity to present their findings to the whole class.